You create a plan in Financial > Settings > Payment Plans. You add the plan to individual students on Profile > Financial (either Dashboard or By Term). (If you've enabled the Online setting, students can also pick a plan when they set up a recurring payment.) You can also put individual invoices on a plan. The plan creates a payment schedule for the student's invoices included in the plan. You can recalculate the scheduled payments or change the payment schedule at any time. There are three sections to a payment plan: Plan Info, Eligible Charges, and Payment Schedule. We'll cover each in turn. Go to Billing > Settings > Payment Plans. Click Add a Payment Plan. Give the plan a name. Enter an optional payment plan fee (which can be a flat amount or a percentage of the invoices on the plan). This fee is charged in addition to the student's other charges. Enter an optional late payment fee (flat amount or percentage-based). Such fees are charged in addition to the student's other charges. You can also enter a maximum amount that a percentage-based fee can charge. Enter an optional grace period for the late payment fee. This lets you wait a certain number of calendar days before the late payment fee is applied. Select an income account (from your chart of accounts) for these fees. Enter an optional minimum invoice amount; invoices under this amount cannot be placed on this payment plan. Check to subtract scheduled financial aid from the plan's calculations. Check if you prefer the plan calculate payments in whole-dollar amounts. Click the drop-down next to the charge type you'd like to modify. Your options are All, None, Only selected, and All except selected. For the latter two options, check the specific charges you'd like to include/exclude. Your payment schedule options will differ depending on your selection under Plan Info. The schedule you create here is a template: if necessary, you'll be able to edit dates and amounts for individual students after putting them on the plan. Based on calendar dates: Each payment falls on the date you specify. 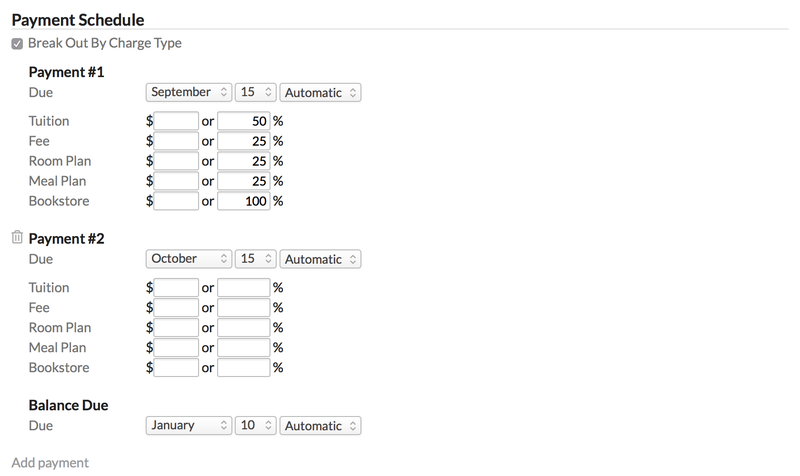 You can also specify calendar years or have Populi automatically figure out the year. Based on # days into term: The payment schedule is considered to begin on the first day of the term to which the invoices on the plan are connected. Based on when the plan is applied: The payment schedule begins on the day you it is added to the student. Recurring fixed-amount payments: You set up a regular interval of payments, each of the same amount, that come due on the same day of the month (or every other month, etc.). Check if you wish to break out each payment by charge type. This lets you require that, for example, the student pay more tuition earlier on and then pay off other fees later. For each payment, enter the amount or percentage the student must pay. Click add payment to add slots for more payments. Make sure to enter something for the Balance Due! Calendar dates: Select the specific payment due dates. You can select specific years or use Automatic to have Populi determine in which year the payment should fall. Based on # days/when plan was applied: Enter the number of calendar days the plan will count. Keep in mind that "Day 0" would be considered the first day of the term or the date the plan is applied. Recurring: Select the interval when payments will be due (every month, every two months, etc. ), enter when the first payment will be due, and enter the amount of the fixed payment. When you're done, scroll back to the top of the screen and click Save! Now that you've set up this payment plan, it's ready to apply to students. This article describes how to use payment plans. Can students choose to be on a payment plan or does it have to be manually entered on the admin side for each individual student? Good question. Students can't choose to be on Payment Plans themselves; they need to be added on the Admin side.